The acutely poisoned patient remains a common problem facing doctors working in acute medicine in the United Kingdom and worldwide. This review examines the initial management of the acutely poisoned patient. Aspects of general management are reviewed including immediate interventions, investigations, gastrointestinal decontamination techniques, use of antidotes, methods to increase poison elimination, and psychological assessment. More common and serious poisonings caused by paracetamol, salicylates, opioids, tricyclic antidepressants, selective serotonin reuptake inhibitors, benzodiazepines, non-steroidal anti-inflammatory drugs, and cocaine are discussed in detail. Specific aspects of common paediatric poisonings are reviewed. Although the overall severity of poisoning in the UK has decreased over the past 10 years the number of poisoned patients presenting to emergency departments (EDs) is increasing, accounting for 5%–10% of an ED’s workload.1–3 Rates of self poisoning in the UK are among the highest in Europe.4 Provision of meticulous supportive care, identification of patients requiring treatment with an antidote, and the appropriate use of methods limiting poison absorption or increasing elimination, remain the cornerstones of management. This article will focus on the initial general management of the poisoned patient and examine more specific issues in the management of the most common and serious poisonings. Accidental poisoning accounts for about 80 000 annual ED attendances in England and is most common in children under 5 years of age,5 although most do not develop significant clinical features.6 There are about 1000 deaths each year in the UK from accidental poisoning, predominantly in adults with 50% of cases attributable to opioid poisoning.7 ED attendances in the UK after intentional self poisoning (347 per 100 000) are increasing and result in more than 2000 deaths each year, however only 29% of all intentional self poisoning deaths occur in hospital.5 Poisoned patients account for 10% of admissions to general medical wards.8 Iatrogenic poisoning caused by prescribing/administration errors or unrecognised adverse drug interactions has recently been identified as a significant problem, and these account for about 1% of calls to the National Poisons Information Service (NPIS), London. Paracetamol remains the most common drug taken in overdose in the UK (50% of intentional self poisoning presentations).1,9 Non-steroidal anti-inflammatory drugs (NSAIDs), benzodiazepines/zopiclone, aspirin, compound analgesics, drugs of misuse including opioids, tricyclic antidepressants (TCAs), and selective serotonin reuptake inhibitors (SSRIs) comprise most of the remaining 50% (box 1). Reductions in the price of drugs of misuse have led to increased cocaine, MDMA (ecstasy), and γ-hydroxybutyrate (GHB) toxicity related ED attendances.10 Clinicians should also be aware that severe toxicity can result from exposure to non-licensed pharmacological or common environmental agents including plants, herbal and traditional remedies, industrial chemicals, heavy metals, and animal bites or stings. Serious clinical effects occur in less than 5% of acutely poisoned patients.5,6 Overall in-hospital mortality rates are less than 0.5%.5 Most poisoned patients can be treated with supportive care during an appropriate period of observation. The challenge for the attending clinician is to identify as early as possible patients who are at risk of developing serious clinical toxicity, and who may benefit from decontamination or a specific intervention. Recent high profile terrorist activities have highlighted the need for ED decontamination facilities and the availability of appropriate antidotal therapy.11,12 Poisoned patients who may contaminate others must be identified early and decontaminated appropriately before treatment. ED staff must be trained to use protective clothing, breathing apparatus, and decontamination facilities. Internet based information services such as Toxbase (http://www.spib.axl.co.uk) and Isabel (http://www.isabel.org.uk) aid triage staff in identifying patients who may benefit from immediate intervention (for example, the administration of activated charcoal). Product information leaflets and older textbooks are often out of date and are not a reliable source of information in managing poisoned patients. The NPIS is a telephone based (0870 600 6266) resource available to all healthcare professionals. The NPIS provides 24 hour on call cover by clinical toxicologists. Hypotension should be treated initially using intravenous (IV) fluids (an initial bolus of 10–20 ml/kg of crystalloid titrated to clinical effect). Hypotension produced by poisons such as opioids, β blockers, or digoxin can in addition be treated using the specific antidote (that is, naloxone, glucagon, and digoxin specific antibodies respectively). Hypotension resistant to treatment with IV fluids or appropriate antidotes is managed by measuring central venous pressure to ensure adequate circulatory filling and then cautious administration of an appropriate inotropic agent. Norepinephrine (noradrenaline) should be considered in poisonings producing peripheral vasodilatation whereas adrenaline is likely to be more effective where there is direct toxin related myocardial depression.15 The use of inotropic agents may worsen cardiovascular toxicity and should generally be discussed with a clinical toxicologist. Measurement of plasma drug concentrations is not routinely helpful in treating poisoned patients and should not be part of clinical care.39 Exceptions include paracetamol, salicylates, iron, lithium (especially in the presence of impaired renal function), theophylline, ethylene glycol, ethanol (when used as an antidote for ethylene glycol or methanol poisoning), and methanol and to a lesser extent digoxin, phenobarbitone, sodium valporate, and carbamazepine.40 Most plasma drug concentrations do not correlate with observed clinical toxicity. Results of toxicology drug screens are rarely available rapidly enough and do not have a significant impact on patient management.41 Most poisoning should be treated on the basis of observed clinical toxicity rather than drug concentration. Toxicology screens may be appropriate in the medicolegal management of poisoned patients or if there is a suspicion of child abuse. Requests for urgent urine or blood toxicology screens should be discussed with a clinical toxicologist to make them as complete and relevant as required. Gastric lavage has no role in routine GI decontamination of acutely poisoned patients. There is no evidence that gastric lavage improves patient outcome.46 Gastric lavage may even push tablets further into the GI tract,53 although a reanalysis of these data has brought this into question.54 Vagal stimulation and hypoxia during gastric lavage potentially increases risk of cardiac arrhythmias.55 Gastric lavage should only be considered in a patient presenting within one hour of ingestion of a potentially life threatening overdose.46 Difficulties of monitoring acutely ill patients during the procedure and the need to maintain airway protection should not be forgotten. Extracorporeal techniques are indicated in only a very limited subset of poisonings and only in patients with serious toxicity.59 There is also the potential for significant complications (for example, hypotension, sepsis, air embolism) and they may entail transferring an unstable patient to another hospital.59 Therefore the use of extracorporeal techniques should always be discussed with a clinical toxicologist. Most paediatric poisoning is accidental in nature and occurs between the ages of 1–5 years. Less than 1% of paediatric poisoning is clinically serious and death is rare.6 However, some drugs including methadone, TCAs, iron, theophylline, antihistamines, methylsalicylate, phenothiazines, quinine/chloroquine, calcium channel blockers, essential oils, and MDMA can cause severe toxicity after very small ingestions.67–69 Although treatment of paracetamol poisoning in the paediatric patient currently follows adult guidelines there is some evidence to suggest that paracetamol is less hepatotoxic in children,70–73 the toxic dose being 200 mg/kg (150 mg/kg in adults), however if there is any doubt regarding the dose of paracetamol ingested a plasma paracetamol concentration should be obtained. Patients are usually asymptomatic or have nausea and vomiting only. Management is guided by a plasma paracetamol concentration (taken at presentation or four hours after ingestion whichever is later) plotted on the Prescott nomogram (fig 1).83,88 Paracetamol concentrations on or above the curve indicate significant risk of hepatotoxicity and warrant treatment with NAC. 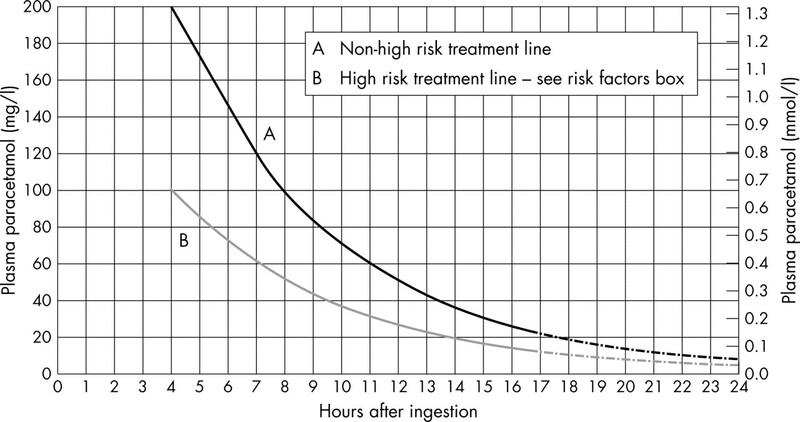 High risk patients are treated using the lower time concentration curve in figure 1. Prescott nomogram for treatment of paracetamol poisoning. NAC provides almost 100% protection if given within eight hours of ingestion and so patients presenting within eight hours of a non-staggered ingestion of any amount of paracetamol do not require immediate treatment with NAC.83,101,102 The decision to administer NAC in this instance can be made on the basis of the paracetamol concentration provided this is obtained within eight hours of ingestion.83 NAC should be started immediately in patients presenting after eight hours of a potentially toxic paracetamol ingestion (>150 mg/kg or >75 mg/kg if in a high risk group) and in any case where paracetamol concentration will not be available within eight hours of ingestion.83 NAC can be withdrawn if the subsequent paracetamol concentration is well below the relevant treatment line on the Prescott nomogram. Paracetamol concentrations obtained within four hours of overdose cannot be interpreted using the nomogram and are not helpful in patient management. It is important to remember that the successful use of the Prescott nomogram to treat paracetamol poisoning is entirely dependent on an accurate knowledge of time zero, the time of ingestion. Clinicians must use the maximum probable period since time of ingestion to avoid treatment failure through inappropriate non-use of NAC. Effective treatment of non-staggered paracetamol overdose is dependent on knowledge of time of ingestion while effective treatment of staggered overdose is dependent on knowledge of total amount ingested. In cases where there is doubt regarding one of these factors and toxicity is possible, it is safer to err on the side of caution and administer NAC. NSAIDs are ingested commonly in overdose, however severe toxicity is rare.115 Ibuprofen overdose was the second most common inquiry received by the NPIS (London) in 2002. Patients presenting within an hour of ingestion of 100 mg/kg of ibuprofen or 10 tablets of any other NSAID should be given AC.43 Seizures are often self limiting, but if persistent should be treated with benzodiazepines.15 Symptoms of gastrointestinal irritation are generally of short duration and therefore may be most effectively treated with antacids, a mucosal protective agent, or an oral proton pump inhibitor (PPI); there is currently little evidence showing which agent is most effective. Although salicylate poisoning is less common than it was 20 years ago, it remains the third most common inquiry received by both the London and Scottish NPIS.10 We have recently produced an evidence based flowchart to guide the management of salicylate poisoning.122 Table 3 summarises toxicokinetics, clinical features, and recommended management of salicylate poisoning. Mild toxicity follows ingestion of more than 150 mg/kg of salicylate123,124 and is characterised by nausea, vomiting, tinnitus, and deafness.124,125 Salicylates produce respiratory alkalosis secondary to direct stimulation of the respiratory centre.126 Uncoupling of oxidative phosphorylation produces metabolic acidosis, which increases the transit of salicylates into the CNS and decreases renal salicylate elimination.127 Children tend to present with a metabolic acidosis, whereas adults who present early after overdose commonly have a respiratory alkalosis that progresses to a mixed acid-base disturbance.128 Compensatory loss of electrolytes via the renal tract further complicates metabolic disturbances. Moderate salicylate poisoning (ingestion of more than 250 mg/kg) produces peripheral vasodilatation, sweating, and agitation.123,124 Decreased platelet function can lead to petechiae and subconjunctival haemorrhage. Hypoglycaemia is more common in children.129 Severe salicylate poisoning follows ingestion of greater than 500 mg/kg123,124 and is characterised by metabolic acidosis, seizures, renal failure, agitation, coma, and eventually cardiovascular collapse.129 Pulmonary and cerebral oedema are rare. Provision of an adequate airway and ventilation, and the appropriate use of naloxone remain the most important aspects in treatment of acute opioid toxicity.24 Patients with significant opioid toxicity have pin-point pupils, depressed respiration, and a decreased level of consciousness.15 Mixed pharmacological effects arising from preparations containing an opioid and a stimulant drug (cocaine and heroin combined as a “speedball”) may cloud this typical clinical picture. Flumazenil is a benzodiazepine antagonist acting on the GABA receptor. We do not advocate the use of flumazenil as either a diagnostic or therapeutic tool in the treatment of acute poisoning. Administration of flumazenil after a mixed overdose may unmask adverse effects of coingestants, particularly cardiotoxic agents such as TCAs leading to seizures or malignant arrhythmias.147–150 Patients who have a history of seizures may develop uncontrolled seizures after receiving flumazenil.151 Administration of flumazenil to patients with a history of long term benzodiazepine use can precipitate an acute withdrawal state.151,152 It is much safer to provide supportive care until benzodiazepine toxicity has resolved. In rare circumstances where airway and ventilatory support are not available, lone benzodiazepine overdose is suspected, and the ingestion of any other drugs has been excluded, flumazenil may be used cautiously in small increments. Patients who remain hypotensive despite a pH in the range of 7.50–7.55 and adequate central venous filling should be discussed with a clinical toxicologist. They may require additional hypertonic saline and the cautious use of inotropes such as adrenaline and norepinephrine (noradrenaline) to maintain adequate systemic perfusion.156,165 Adrenaline and norepinephrine have the potential to cause further cardiac toxicity and should only be used after administration of sodium bicarbonate. All patients who present after deliberate self poisoning should be assessed to determine the risk of further self harm. Box 3 lists the risk factors indicating serious self harm intent and high likelihood of further significant self harm.1 Patients who are at risk of further self harm should receive appropriate assessment by the psychiatry team during medical treatment of the poisoning. Most acutely poisoned patients can be managed with supportive care during a period of observation in an ED observation ward or general medical ward, or for those with severe poisoning, a critical care ward (HDU or ICU). Information sources are available to identify patients who will benefit form an early or specific intervention. The potential benefit of using gastrointestinal decontamination techniques and methods to increase toxin elimination should be assessed for each individual patient. The commonest form of self poisoning in the UK is paracetamol poisoning. Presentation within eight hours of ingestion can be successfully treated with the antidote N-acetylcysteine, but delay in antidote administration beyond eight hours is associated with reduced efficacy and increased risk of hepatotoxicity. In cases where the time of ingestion or amount of paracetamol ingested is unclear it is safest to treat the patient with NAC. Patients with signs of ALF should receive further NAC and be discussed with a specialist liver unit. The reduction in the price of drugs of misuse has lead to an increase in opioid, cocaine, and benzodiazepine poisoning. Naloxone is a safe antidote that can be used as a diagnostic and therapeutic agent in treating opioid poisoning. Naloxone is best administered IV and titrated to restore adequate respiratory function. Flumazenil should not routinely be used to treat benzodiazepine poisoning because of the risk of significant adverse events; most patients are successfully treated with good supportive care. Thrombolysis is not routinely indicated in the treatment of patients with cocaine related myocardial infarction. Initial treatment is aimed at decreasing coronary artery spasm (with benzodiazepines and nitrates) and platelet aggregation (with aspirin). TCAs are more toxic in overdose relative to SSRIs. Sodium bicarbonate is the antidote of choice in TCA poisoning and should be used early in patients who have QRS prolongation, cardiac arrhythmias, hypotension, or seizures. QRS prolongation is a prognostic indicator for the occurrence of seizures and malignant arrhythmias. All poisoned patients who have taken an intentional overdose should undergo a psychological assessment as a routine part of their treatment. Townsend E, Hawton K, Harriss L, et al. Substances used in deliberate self-poisoning 1985–1997: trends and associations with age, gender, repetition and suicide intent. Soc Psychiatry Psychiatr Epidemiol2001;36:228–34. WHO/EURO. Results of the WHO/EURO multicentre study on parasuicide. Acta Psychiatr Scand1996;93:327–38. Michel K, Ballinari P, Bille-Brahe U, et al. Methods used for parasuicide: results of the WHO/EURO Multicentre Study on Parasuicide. Soc Psychiatry Psychiatr Epidemiol2000;35:156–63. Schmidtke A, Bille-Brahe U, Deleo D, et al. Attempted suicide in Europe: rates, trends, and sociodemographic characteristics of suicide attempters during the period 1989–1992. Acta Psychiatr Scand1996;93:327–38. Gunnell D, Ho D, Murray V. Medical management of deliberate drug overdose: a neglected area for suicide prevention? Emerg Med J2004;21:35–8. Watson WA, Litovitz TL, Rodgers GC, et al. 2002 Annual report of the American Association of Poison Control Centres Toxic Exposure Surveillance System. Am J Emerg Med2003;21:353–421. Flanagan RJ, Rooney C. Recording acute poisoning deaths. Forensic Sci Int2002;128:3–19. Hawton K, Fagg J, Simkin S, et al. Trends in deliberate self-harm in Oxford, 1985–1995. Implications for clinical services and the prevention of suicide. Br J Psychiatry1997;171:556–60. Hawton K, Townsend E, Deeks J, et al. Effects of legislation restricting pack sizes of paracetamol and salicylate on self poisoning in the United Kingdom: before and after study. BMJ2001;322:1203–7. Camidge DR, Wood RJ, Bateman DN. The epidemiology of self-poisoning in the UK. Br J Clin Pharmacol2003;56:613–19. Flanagan RJ, Jones AL. Antidotes. London: Taylor-Francis, 2001. Okumura T, Suzuki K, Fukuda A, et al. The Tokyo subway Sarin attack disaster management. Part 2; Hospital report. Acad Emerg Med1998;6:618–24. Albertson TE, Dawson A, de Latorre F, et al. American Heart Association; International Liaison Committee on Resuscitation. TOX-ACLS: toxicologic-oriented advanced cardiac life support, Ann Emerg Med2001;37:S78–90. Mokhlesi B, Leikin JB, Murray P, et al. Adult toxicology in critical care: Part II: specific poisonings. Chest. 2003 Mar 123:897–922. Jones AL, Dargan PI. Churchill’s pocket book of toxicology. London: Churchill Livingstone, 2001. British Medical Association, Royal Pharmaceutical Society of Great Britain. British National Formulary. London: BMA/RPSGB, Mar, 2004. Callaham M, Schumaker H, Pentel P. Phenytoin prophylaxis of cardiotoxicity in experimental amitriptyline poisoning. J Pharmacol Exp Ther1988;245:216–20. Markowitz JC, Brown RP. Seizures with neuroleptics and antidepressants. Gen Hosp Psychiatry1987;9:135–41. Wech R, Chue P. Antipsychotic agents and QT changes. J Psychiatry Neurosci2000;25:154–60. Blum K, Eubanks JD, Wallace JE, et al. Enhancement of alcohol withdrawal convulsions in mice by haloperidol. Clin Toxicol1976;9:427–34. Derlet RW, Albertson TE, Rice P. The effect of haloperidol in cocaine and amphetamine intoxication. J Emerg Med1989;7:633–7. Bosse GM. Antidiabetic and Hypoglycaemic Agents. In: Goldfrank LR, Flomenbaum NE, Lewin NA, et al, eds. Goldfranks toxicologic emergencies. 7th ed. New York: McGraw-Hill, 2002:858–9. Graudins A, Linden CH, Ferm RP. Diagnosis and treatment of sulfonylurea-induced hyperinsulinemic hypoglycemia. Am J Emerg Med1997;15:95–6. Clarke SF, Dargan PI, Jones AL. Naloxone—a systematic review. Emerg Med J. (in press). Hoffman RS, Goldfrank LR. The poisoned patient with altered consciousness. Controversies in the use of a ‘coma cocktail’. JAMA1995;274:562–9. Schrier RW, Henderson HS, Tisher CC, et al. Nephropathy associated with heat stress and exercise. Ann Intern Med1967;67:356–76. Vertel RM, Knochel JP. Acute renal failure due to heat injury. An analysis of ten cases associated with a high incidence of myoglobinuria. Am J Med1967;43:435–51. Greene SL, Dargan PI, O’Connor N, et al. Multiple toxicity from 3,4-methylenedioxymethamphetamine (“ecstasy”). Am J Emerg Med2003;21:121–4. Ginsberg MD, Hertzman M, Schmidt-Nowara WW. Amphetamine intoxication with coagulopathy, hyperthermia, and reversible renal failure. A syndrome resembling heatstroke. Ann Intern Med1970;73:81–5. Hollander JE, Hoffman RS. Cocaine. In: Goldfrank LR, Flomenbaum NE, Lewin NA, et al, eds. Goldfranks toxicologic emergencies. 7th ed. New York: McGraw-Hill, 2002:1004–17. Graudins A, Stearman A, Chan B. Treatment of the serotonin syndrome with cyproheptadine. J Emerg Med1998;16:615–19. Mc Caron MM, Boettger ML, Peck JJ. A case of neuroleptic malignant syndrome successfully treated with amantadine. J Clin Psychiatry1982;43:381–2. Greene SL, Dargan PI, Shin GY, et al. Doctors and nurses estimation of the weight of patients—a source of systematic error? J Toxicol Clin Toxicol2004;42:611–15. Dargan PI, Ladhani S, Jones AL. Measuring plasma paracetamol concentrations in all patients with drug overdose or altered consciousness: does it change outcome? Emerg Med J2001;18:178–82. Hartington K, Hartley J, Clancy M. Measuring plasma paracetamol concentrations in all patients with drug overdoses; development of a clinical decision rule and clinicians willingness to use it. Emerg Med J2002;19:408–11. Wood DM, Dargan PI, Jones AL. Measuringplasma salicylate concentrations in all patients with drug overdose or altered consciousness: is it necessary? Emerg Med J. (in press). Rainley PM. Laboratory principles and techniques for evaluation of the poisoned or overdosed pateint. In: Goldfrank LR, Flomenbaum NE, Lewin NA, et al, eds. Goldfranks toxicologic emergencies. 7th ed. New York: McGraw-Hill, 2002:69–93. Baselt RC. Disposition of toxic drugs and chemicals in man. 6th ed. Foster City, CA: Biomedical Publications, 2002:247–53. National Poisons Information Service; Association of Clinical Biochemists. Laboratory analyses for poisoned patients: joint position paper. Ann Clin Biochem2002;39:328–39. Wu AH, McKay C, Broussard LA, et al. National academy of clinical biochemistry laboratory medicine practice guidelines: recommendations for the use of laboratory tests to support poisoned patients who present to the emergency department. Clin Chem2003;49:357–79. Dawson AH, Whyte IM. Evidence in clinical toxicology: the role of therapeutic drug monitoring. Ther Drug Monit2002;24:159–62. Baselt RC. Disposition of toxic drugs and chemicals in man. 6th ed. Foster City, CA: Biomedical Publications, 2002:472–5, 70710. American Academy of Clinical Toxicology and European Association of Poisons Control Centres and Clinical Toxicologists. Position statement: Single-dose activated charcoal. J Toxicol Clin Toxicol1997;35:721–41. American Academy of Clinical Toxicology and European Association of Poisons Control Centres and Clinical Toxicologists. Position statement: ipecac syrup. J Toxicol Clin Toxicol1997;35:699–709. American Academy of Clinical Toxicology; European Association of Poisons Centres and Clinical Toxicologists. Position statement and practice guidelines on the use of multi-dose activated charcoal in the treatment of acute poisoning. J Toxicol Clin Toxicol1999;37:731–51. American Academy of Clinical Toxicology and European Association of Poisons Control Centres and Clinical Toxicologists. Position statement: gastric lavage. J Toxicol Clin Toxicol1997;35:711–19. American Academy of Clinical Toxicology and European Association of Poison Control Centres and Clinical Toxicologists. Position statement: whole bowel irrigation. J Toxicol Clin Toxicol1997;35:753–62. Thakore S, Murphy N. The potential role of prehospital administration of activated charcoal. Emerg Med J2002;19:63–5. Karim A, Ivatts S, Dargan PI, et al. How feasible is it to conform to the European guidelines on the administration of activated charcoal within one hour of overdose? Emerg Med J2001;18:390–2. Wolseley BA, McKinney PE. Does transportation by ambulance decrease time to gastrointestinal decontamination after overdose? Ann Emerg Med2000;35:579–84. Bond GR. The role of activated charcoal and gastric emptying in gastrointestinal decontamination: a state-of-the-art review. Ann Emerg Med. 2002 Mar 39:273–86. Neuvonen PJ, Olkkola KT. Oral activated charcoal in the treatment of intoxications. Role of single and repeated doses. Med Toxicol Adverse Drug Exp1988;3:33–58. Saetta JP, March S, Gaunt ME. Gastric emptying procedures in the self poisoned patient: are we forcing gastric content beyond the pylorus? J R Soc Med1991;84:274–6. Eddleston M, Juszczak E, Buckley N. Does gastric lavage really push poisons beyond the pylorus? A systematic review of the evidence. Ann Emerg Med2003;42:359–64. Thompson AM, Robins JB, Prescott LF. Changes in cardiorespiratory function during gastric lavage for drug overdose. Hum Exp Toxicol1987;6:215–18. Tenenbein M . Whole bowel irrigation as a gastrointestinal decontamination procedure after acute poisoning. Med Toxicol1988;3:77–84. Morgan AG, Polak A. The excretion of salicylate in salicylate poisoning. Clin Sci1971;41:475–84. Proudfoot AT, Krenzelok EP, Vale JA. Position Paper on urine alkalinization. J Toxicol Clin Toxicol2004;42:1–26. Pond SM. Diuresis, dialysis, and hemoperfusion. Indications and benefits. Emerg Med Clin North Am1984;2:29–45. Scharman EJ. Methods used to decrease lithium absorption or enhance elimination. J Toxicol Clin Toxicol1997;35:601–8. Jacobsen D, Wilk-Larsen E, Bredesen JE. Haemodialysis or haemoperfusion in severe salicylate poisoning? Hum Toxicol1988;7:161–3. Hootkins R Sr, Lerman MJ, Thompson JR. Sequential and simultaneous “in series” hemodialysis and hemoperfusion in the management of theophylline intoxication. J Am Soc Nephrol1990;1:923–6. Barceloux DG, Bond GR, Krenzelok EP, et al. American Academy of Clinical Toxicology Ad Hoc Committee on the Treatment Guidelines for Methanol Poisoning. J Toxicol Clin Toxicol2002;40:415–46. Barceloux DG, Krenzelok EP, Olsen K, et al. American Academy of Clinical Toxicology Practice guidelines on the treatment of ethylene glycol poisoning. Ad Hoc Committee. J Toxicol Clin Toxicol1999;37:537–60. Park GD, Spector R, Roberts RJ, et al. Use of hemoperfusion for treatment of theophylline intoxication. Am J Med1983;74:961–6. Cutler RD, Forland SC, John PG. Extracorporeal removal of drugs and poisons by hemodialysis and hemoperfusion. Ann Rev Pharmacol Toxicol1987;27:169–91. Bar-Oz B, Levichek Z, Koren G. Medications that can be fatal for a toddler with one tablet or teaspoonful: a 2004 update. Pediatric Drugs2004;6:123–6. Koren G . Medications which can kill a toddler with one tablet or teaspoon. J Toxicol Clin Toxicol1993;31:407–13. Liebelt EL, Shannon MW. Small doses, big problems: a selected review of highly toxic common medications. Pediatr Emerg Care1993;9:292–7. Anderson BJ, Holford NHG, Armishaw JC. Predicting concentrations in children presenting with acetaminophen overdose. J Pediatr1999;135:290–5. Bond GR, Krenzelok EP, Normann SA. Acetaminophen ingestion in childhood—cost and relative risk of alternative referral strategies. J Toxicol Clin Toxicol1994;32:513–25. Mohler CR, Nordt SP, Williams SR, et al. Prospective evaluation of mild to moderate pediatric acetaminophen exposures. Ann Emerg Med2000;35:239–44. Caravati EM. Unintentional acetaminophen ingestion in children and the potential for hepatotoxicity. J Toxicol Clin Toxicol2000;38:291–6. Litovitz T, Schmitz BF. Ingestionn of cylindrical and button batteries: an analysis of 2382 cases. J Pediatr1984;89:747–57. Kulig K, Rumack C, Rumack B, et al. Disk battery ingestion—elevated urine mercury levels and enema removal of battery fragments. JAMA1983;249:2502–4. Singalet D, Lees G. Tracheosophageal injury secondary to disk battery ingestion. J Pediatr Surg1988;23:996–8. Wilson JA, Phillips EM. Endoscopic retrieval of a miniature battery. Gut1985;26:215. Rumack Cm, Rumack BH. Battery Ingestions. Pediatrics1992;89:771–2. Liovitz T, Butterfield AB, Holloway RR, et al. Battery ingestion: assessment of therapeutic modalities and battery discharge state. J Pediatr1984;105:868–73. Litovitz TL, Flagler SL, Manoguerra AS, et al. Recurrent poisonings among pediatric poisoning victims. Med Toxicol1989;4:381–6. Demorest RA, Posner JC, Osterhoudt KC, et al. Poisoning prevention education during emergency department visits for childhood poisoning. Pediatr Emerg Care2004;20:281–4. Fagan E, Wannan G. Reducing paracetamol overdoses. BMJ1996;313:1417–18. Wallace CI, Dargan PI, Jones AL. Paracetamol overdose: an evidence based flowchart to guide management. Emerg Med J2002;19:202–5. Prescott LF, Illingworth RN, Critchley JA, et al. Intravenous N-acetylcysteine: the treatment of choice for paracetamol poisoning. BMJ1979;2:1097–100. Jones AL. Recent advances in the management of late paracetamol poisoning. Emergency Medicine (Australia)2000;12:14–21. Jones AL. Mechanism of action and value of N-acetylcysteine in the treatment of early and late acetaminophen poisoning: a critical review. J Toxicol Clin Tox1998;36:277–85. Prescott LF. Paracetamol overdosage: pharmacological considerations and clinical management. Drugs1983;23:290–314. NPIS. Management of acute paracetamol poisoning. Guidelines agreed by the UK National Poisons Information Service 1998. (Supplied to Accident and Emergency Centres in the United Kingdom by the Paracetamol Information Centre in collaboration with the British Association for Accident and Emergency Medicine). London: NPIS, 1998. Prescott LF. Paracetamol (acetaminophen). A critical bibliographic review. London: Taylor and Francis, 1996. Buhl R, Jaffe HA, Holroyd KA. Systemic glutathione deficiency in symptom-free HIV-seropositive individuals. Lancet1989;ii:1294–8. Whitcomb DC, Block GD. Association of acetaminophen hepatotoxicity with fasting and ethanol use. JAMA1994;272:1845–50. Wright N, Prescott LF. Potentiation by previous drug therapy of hepatotoxicity following paracetamol overdose. Scott Med J1973;18:56–8. Smith JA, Hine ID, Beck P, et al. Paracetamol toxicity: is enzyme induction important? Hum Exp Toxicol1986;5:383–5. Minton N, Henry JA, Frankel RJ. Fatal paracetamol poisoning in an epileptic. Hum Exp Toxicol1988;7:33–4. Prescott LF. Paracetamol, alcohol and the liver. Br J Clin Pharmacol2000;49:291–301. Bray GP, Mowat C, Muir DF, et al. The effect of chronic alcohol intake on prognosis and outcome in paracetamol overdose. Hum Exp Toxicol1991;10:435–8. Buckley NA, Sinivasan J. Should a lower treatment line be used when treating paracetamol poisoning in patients with chronic alcoholism? : a case for, Drug Saf2002;25:619–24. Dargan PI, Jones AL. Should a lower treatment line be used when treating paracetamol poisoning in patients with chronic alcoholism? : a case against, Drug Saf2002;25:625–32. Buckley NA, Whyte IM, O’Connell DL, et al. Activated charcoal reduces the need for N-acetylcysteine treatment after acetaminophen (paracetamol) overdose. J Toxicol Clin Toxicol1999;37:753–7. Clark RF, Chen R, Williams SR, et al. The use of ondansetron in the treatment of nausea and vomiting associated with acetaminophen poisoning. J Toxicol Clin Toxicol1996;34:163–7. Prescott LF, Park J, Ballantyne A, et al. Treatment of paracetamol (acetaminophen) poisoning with N-acetylcysteine. Lancet1977;ii:432–4. Prescott LF, Roscoe P, Wright N, et al. Plasma-paracetamol half-life and hepatic necrosis in patients with paracetamol overdosage. Lancet1971;i:519–22. Vale JA, Proudfoot AT. Paracetamol (acetaminophen) poisoning. Lancet1995;346:547–52. Mant TG, Tempowski JH, Volans GN, et al. Adverse reactions to acetylcysteine and effects of overdose. BMJ1984;289:217–19. Bailey B, McGuigan MA. Management of anaphylactoid reactions to N-acetylcysteine. Ann Emerg Med1998;31:710–15. Ho SW, Beilin LJ. Asthma associated with N-acetylcysteine infusion and paracetamol poisoning:report of two cases. BMJ (Clin Res Ed)1983;287:876–7. Schmidt LE, Dalhoff K. Risk factors in the development of adverse reactions to N-acetylcysteine in patients with paracetamol poisoning. Br J Clin Pharmacol2001;51:87–91. Appelboam AV, Dargan PI, Knighton J. Fatal anaphylactoid reaction to N-acetylcysteine: caution in patients with asthma. Emerg Med J2002;19:594–5. Vale JA, Meredith TJ, Goulding R. Treatment of acetaminophen poisoning. The use of oral methionine. Arch Intern Med1981;141:394–6. Harrison PM, Keays R, Bray GP, et al. Improved outcome of paracetamol induced fulminant hepatic failure by late administration of acetylcysteine. Lancet1990;335:1572–3. Whyte IM, Seldon M, Buckley NA, et al. Effect of paracetamol poisoning on international normalised ratio. Lancet2003;361:429. Makin A, Williams R. The current management of paracetamol overdosage. Br J Clin Pharmacol1994;48:144–8. Dargan PI, Jones AL. Acetaminophen poisoning: an update for the intensivist. Crit Care2002;6:108–10. Hall AH, Smolinskie SC, Conrad FL. Ibuprofen overdose: 126 cases. Ann Emerg Med1986;15:1308–12. Halpern SM, Fitzpatrick R, Volans GN. Ibuprofen toxicity: a review of adverse reactions and overdose. Adverse Drug React Toxicol Rev1993;12:107–28. Hall AH, Smolinske SC, Kulig KW. Ibuprofen overdose: a prospective study. West J Med1988;48:653–6. Balai-Mood M, Proudfoot AT, Critchley J. Mefanamic acid overdose. Lancet1981;ii:1324–56. Linden CH, Townswend PL. Metabolic acidosis after acute ibuprofen overdose. J Pediatr1987;111:922–5. Kulling PE, Backman EA, Skagius AS. Renal Impairment after acute diclofenac, naproxen, and sulindac overdoses. Clin Toxicol J Toxicol1995;33:173–7. Kertesz A . Neurological complications of non-steroidal anti-inflammatory agents. In: Borda I, Koff R, eds. Nonsteroidal Antiinflammatory drugs: a profile of adverse effects. Philadelphia: Hanley and Belfus, 1992:147–55. Dargan PI, Wallace CI, Jones AL. An evidence based flowchart to guide the management of acute salicylate (aspirin) overdose. Emerg Med J2002;19:206–9. Brenner BE, Simon RR. Mangement of salicylate intoxication. Drugs1982;24:335–40. Temple AR. Acute and chronic effects of aspirin toxicity and their treatment. Arch Intern Med1981;141:364–9. Gabow PA. How to avoid overlooking salicylate intoxication. J Crit Illness1986;1:77–85. Tenney SM, Miller RM. The respiratory and circulatory action of salicylate. Am J Med1955;19:498–508. Kaplan E, Kennedy J, David J. Effects of salicylates and other bezoates on oxidative enzymes of the tricarboxylic cycle in rat tissue homogenates. Arch Biochem Biophys1954;51:47–61. Gaudreault P, Temple AR, Lovejoy FH Jr. The relative severity of acute versus chronic salicylate poisoning in children: a clinical comparison. Pediatrics1982;70:566–9. Chapman BJ, Proudfoot AT. Adult salicylate poisoning: deaths and outcome in patients with high plasma salicylate concentrations. Q J Med1989;72:699–707. Danel V, Henry JA, Glucksman E. Activated charcoal, emesis, and gastric lavage in aspirin overdose. BMJ (Clin Res Ed)1988;296:1507. Hillman RJ, Prescott LF. Treatment of salicylate poisoning with repeated oral charcoal. BMJ (Clin Res Ed)1985;291:1472. Kirshenbaum LA, Mathews SC, Sitar DS, et al. Does multiple-dose charcoal therapy enhance salicylate excretion? Arch Intern Med1990;150:1281–3. Proudfoot AT. Toxicity of salicylates. Am J Med1983;75:99–103. Done AK. Salicylate intoxication: significance of measurements of salicylate in blood in cases of acute intoxication. Pediatrics1960;26:800–7. Prescott LF, Balali-Mood M, Critchley JA, et al. Diuresis or urinary alkalinisation for salicylate poisoning? BMJ (Clin Res Ed)1982;285:1383–6. Yip L, Dart RC, Gabow PA. Concepts and controversies in salicylate toxicity. Emerg Med Clin North Am1994;12:351–64. Todd PJ, Sills JA, Harris F, et al. Problems with overdoses of sustained-release aspirin. Lancet1981;i:777. Nelson LS. Opioids. In: Goldfrank LR, Flomenbaum NE, Lewin NA, et al, eds. Goldfranks toxicologic emergencies. 7th ed. New York: McGraw-Hill, 2002:901–23. Watson WA. Opioid toxicity recurrence after an initial response to naloxone. Clin Toxicol1998;36:11–17. Hawton K, Simikin S, Deeks J. Co-proxamol and suicide: a study of national mortality statistics and local non-fatal self poisonings. BMJ2003;326:1006–8. Lund-Jacobsen H . Cardio-respiratory toxicity of propoxyphene and norpropoxyphene in conscious rabbits. Acta Pharmacol Toxicol1978;42:171–8. Stork CM, Reed JT, Fine K, et al. Propoxyphene-induced wide QRS complex dysrhythmia responsive to sodium bicarbonate–a case report. J Toxicol Clin Toxicol1995;33:179–83. Hojer J, Braehrendtz S, Gustafsson L. Benzodiazepine poisoning: experience of 702 admissions to an intensive care unit during a 14-year period. J Intern Med1989;226:117–22. Greenblatt DJ, Allen MD, Noel BJ. Acute overdose with benzodiazepine derivatives. Clin Pharmacol Ther1977;21:497–514. Serfaty M, Masterton G. Fatal poisonings attributed to benzodiazepines in Britain during the 1980s. Br J Psychiatry1993;163:386–93. Martens F, Koppel C, Ibe K, et al. Clinical experience with the benzodiazepine antagonist flumazenil in suspected benzodiazepine or ethanol poisoning. J Toxicol Clin Toxicol1990;28:341–56. Haverkos GP, DiSalvo RP, Imhoff TE. Fatal seizures after flumazenil administration in a patient with a mixed drug overdose. Ann Pharmacother1994;28:1347–9. Herd B, Clarke F Herd B, Clarke F. Complete heart block after flumazenil. Hum Exp Toxicol1991;10:289. Geller E, Crome P, Schaller MD, et al. Risks and benefits of therapy with flumazenil (Anexate) in mixed drug intoxications. Eur Neurol1991;31:241–50. Amerin R, Leishman B, Bentzinger C, et al. Flumazenil in benzodiazepine antagonism. Actions and clinical use in intoxications and anaesthesiology. Med Toxicol Adverse Drug Exp1987;2:411–29. Spivey WH. Flumazenil and seizures: analysis of 43 cases. Clin Ther1992;14:292–305. Frommer DA, Kulig KW, Marx JA, et al. Tricyclic antidepressant overdose. A review. JAMA1987;257:521–6. Callaham M, Kassel D. Epidemiology of fatal tricyclic antidepressant ingestion: implications for management. Ann Emerg Med1985;14:1–9. Shannon M . Duration of QRS disturbances after severe tricyclic antidepressant intoxication. J Toxicol Clin Toxicol1992;30:377–86. Liebelt EL, Francis PD. Cyclic Antidepressants. In: Goldfrank LR, Flomenbaum NE, Lewin NA, et al, eds. Goldfranks toxicologic emergencies. 7th ed. New York: McGraw-Hill, 2002:847–64. Henry JA. Epidemiology and relative toxicity of antidepressant drugs in overdose. Drug Saf1997;16:374–90. Sasyniuk BI, Jhamandas V. Mechanism of reversal of toxic effects of amitriptyline on cardiac Purkinje fibers by sodium bicarbonate. J Pharmacol Exp Ther1984;231:387–94. Pellinen TJ, Farkkila M, Heikkila J, et al. Electrocardiographic and clinical features of tricyclic antidepressant intoxication. A survey of 88 cases and outlines of therapy. Ann Clin Res1987;19:12–17. Shannon MW, Merola J, Lovejoy FH Jr. Hypotension in severe tricyclic antidepressant overdose. Am J Emerg Med1988;6:439–42. Pentel PR, Benowitz NL. Tricyclic antidepressant poisoning. Management of arrhythmias. Med Toxicol1986;1:101–21. Boehnert MT, Lovejoy FH Jr. Value of the QRS duration versus the serum drug level in predicting seizures and ventricular arrhythmias after an acute overdose of tricyclic antidepressants. N Engl J Med1985;313:474–9. Caravati EM, Bossart PJ. Demographic and electrocardiographic factors associated with severe tricyclic antidepressant toxicity. J Toxicol Clin Toxicol1991;29:31–43. Liebelt EL, Francis PD, Woolf AD. ECG lead aVR versus QRS interval in predicting seizures and arrhythmias in acute tricyclic antidepressant toxicity. Ann Emerg Med1995;26:195–201. Hoffman JR. Overdose with cardiotherapeutic agents. Geriatrics1983;38:51–65. Levitt MA, Sullivan JB, Owens SM, et al. Amitriptyline plasma protein binding: effect of plasma pH and relevance to clinical overdose. Am J Emerg Med1986;4:121–5. McCabe JL, Cobaugh DJ, Menegazzi JJ, et al. Experimental tricyclic antidepressant toxicity: a randomized, controlled comparison of hypertonic saline solution, sodium bicarbonate, and hyperventilation. Ann Emerg Med1998;32:329–33. Sasyniuk BI, Jhamandas V, Valois M. Experimental amitriptyline intoxication: treatment of cardiac toxicity with sodium bicarbonate. Ann Emerg Med1986;15:1052–9. Orr DAK, Bramble MG. Tricyclic antideressant poisoning and prolonged external cardiac massage during asystole. BMJ1981;283:1107–8. Southall DP, Kilpatrick SM. Imipramine poisoning: survival of a child after prolonged cardiac massage. BMJ1974;4:508. Beaubein AR, Carpenter DC, Mathieu FL. Antagonism of imipramine poisoning by anticonvulsants in the rat. Toxicol Appl Pharmacol1976;38:1–6. Borys DJ, Setzer SC, Ling LJ, et al. Acute fluoxetine overdose: a report of 234 cases. Am J Emerg Med1992;10:115–20. Braitberg G, Curry SC. Seizure after isolated fluoxetine overdose. Ann Emerg Med1995;26:234–7. Graudins A, Vossler C, Wang R. Fluoxetine-induced cardiotoxicity with response to bicarbonate therapy. Am J Emerg Med1997;15:501–3. Johnsen CR, Hoejlyng N. Hyponatremia following acute overdose with paroxetine. Int J Clin Pharmacol Ther1998;36:333–5. Personne M, Sjoberg G, Persson H. Citalopram overdose–review of cases treated in Swedish hospitals. J Toxicol Clin Toxicol1997;35:237–40. White CM, Hailey RA, Levin GM, et al. Seizure resulting from a venlafaxine overdose. Ann Pharmacother1997;31:178–80. Zhalkovsky B, Walker D, Bourgeois JA. Seizure activity and enzyme elevations after venlafaxine overdose. J Clin Psychopharmacol1997;17:490–1. Banham NDG. Fatal venlafaxine overdose. Med J Aust1998;169:445–8. Blythe D, Hackett LP. Cardiovascular and neurological toxicity of venlafaxine. Hum Exp Toxicol1999;18:309–13. Whyte IM, Dawson AH, Buckley NA. Relative toxicity of venlafaxine and selective serotonin reuptake inhibitors in overdose compared to tricyclic antidepressants. Q J Med2003;96:369–74. Chan BS, Graudins A, Whyte IM, et al. Serotonin syndrome resulting from drug interactions. Med J Aust1998;169:523–5. Daniels RJ. Serotonin syndrome due to venlafaxine overdose. J Accid Emerg Med1998;15:333–7. Martin TG. Serotonin syndrome. Ann Emerg Med1996;28:520–6. Kolecki P . Isolated venlafaxine-induced serotonin syndrome. J Emerg Med1997;15:491–3. Rosebush PI, Margetts P, Mazurek MF. Serotonin syndrome as a result of clomipramine monotherapy. J Clin Psychopharmacother1999;19:285–7. Stork CM. Serotonin reuptake inhibitors and atypical antidepressants. In: Goldfrank LR, Flomenbaum NE, Lewin NA, et al, eds. Goldfranks toxicologic emergencies. 7th ed. New York: McGraw-Hill, 2002:868–9. Hollander JE, Hoffman RS, Gennis P, et al. Prospective multicenter evaluation of cocaine-associated chest pain. Acad Emerg Med1994;1:330–9. Richard A Lange MD, L David Hillis MD. Cardiovascular complications of cocaine use. N Engl J Med2001;345:351–8. Mittleman MA, Mintzer D, Maclure M, et al. Triggering of myocardial infarction by cocaine. Circulation1999;99:2737–41. Lange RA, Cigarroa RG, Yancy CW Jr, et al. Cocaine-induced coronary-artery vasoconstriction. N Engl J Med1989;321:1557–62. Flores ED, Lange RA, Cigarroa RG, et al. Effect of cocaine on coronary artery dimensions in atherosclerotic coronary artery disease: enhanced vasoconstriction at sites of significant stenoses. J Am Coll Cardiol1990;16:74–9. Moliterno DJ, Willard JE, Lange RA, et al. Coronary-artery vasoconstriction induced by cocaine, cigarette smoking, or both. N Engl J Med1994;330:454–9. Rezkalla SH, Mazza JJ, Kloner RA, et al. Effects of cocaine on human platelets in healthy subjects. Am J Cardiol1993;72:243–6. Kugelmass AD, Oda A, Monahan K, et al. Activation of human platelets by cocaine. Circulation1993;88:876–83. Rinder HM, Ault KA, Jatlow PI, et al. Platelet alpha-granule release in cocaine users. Circulation1994;90:1162–7. Kolodgie FD, Virmani R, Cornhill JF, et al. Increase in atherosclerosis and adventitial mast cells in cocaine abusers: an alternative mechanism of cocaine-associated coronary vasospasm and thrombosis. J Am Coll Cardiol1991;17:1553–60. Kolodgie FD, Wilson PS, Mergner WJ, et al. Cocaine-induced increase in the permeability function of human vascular endothelial cell monolayers. Exp Mol Pathol1999;66:109–22. Gan X, Zhang L, Berger O, et al. Cocaine enhances brain endothelial adhesion molecules and leukocyte migration. Clin Immunol1999;91:68–76. Gitter MJ, Goldsmith SR, Dunbar DN, et al. Cocaine and chest pain: clinical features and outcome of patients hospitalized to rule out myocardial infarction. Ann Intern Med1991;115:277–82. Hollander JE, Levitt MA, Young GP, et al. Effect of recent cocaine use on the specificity of cardiac markers for diagnosis of acute myocardial infarction. Am Heart J1998;135:245–52. Lange RA, Cigarroa RG, Flores ED, et al. Potentiation of cocaine-induced coronary vasoconstriction by beta-adrenergic blockade. Ann Intern Med1990;112:897–903. Guidelines 2000 for cardiopulmonary resuscitation and emergency cardiovascular care. 8. Advanced challenges in resuscitation. 2. Toxicology in ECC. Circulation2000;102:1–223. ACLS. Guidelines 2000 for cardiopulmonary resuscitation and emergency cardiovascular care. 6. Advanced cardiovascular life support. 1. Introduction to ACLS 2000: overview of recommended changes in ACLS from the Guidelines 2000 conference, Circulation2000;102:1–86.